Read our helpful guide to second hand Maserati GranCabrio. 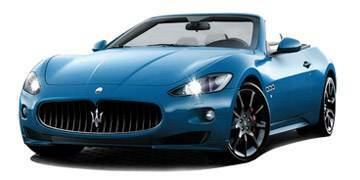 AA Cars works closely with thousands of UK used car dealers to bring you one of the largest selections of Maserati GranCabrio cars on the market. You can also browse Maserati dealers to find a second hand car close to you today. All used Maserati GranCabrio on the AA Cars website come with free 12 months breakdown cover. The Maserati GranCabrio is the convertible version of the GranTurismo coupé, and was first released in 2010; three years after its base model's launch. With four seats and plenty of space, the GranCabrio is unusually large for a car of such svelte dimensions or such sleek looks. This impressive size does mean that it doesn't handle quite as well as some of its more compact cabrios, but its 4.7 litre V8 engine gives it plenty of power, keeping it exciting. The roof is expertly made, as is the cabin - in line with Maserati's usually excellent output - which, along with calm refinement at cruising speeds and typically beautiful Italian style, makes the GranCabrio an exciting and desirable convertible.